Team 22, a Victorian charity raising funds for spinal cord injury survivors, will be officially launched tonight – Friday, April 12 – at the MCG in Melbourne during the Collingwood vs Western Bulldogs game. This is as the Victorian Wheelchair Football League returns for a new season. Team 22 has at the core of its mission to celebrate ‘the power of two’ – the power someone has to help another. “You have the power to help another person. Nothing is more powerful,” the founders say. Team 22 spokesperson Beau Vernon was left a quadriplegic from a football accident in 2012. He told the ABC’s Radio National initially he felt shuttered. “All needy thoughts go through your mind at that stage: ‘Why me?’; ‘What’s the point of living?’… But if you look at it, there are people far worse off than us. “I want to live the best life I can live so you’ve got to do something about it yourself, set goals for yourself…I want to make the best of my life”. Vernon told AFL.com.au a strong support network was crucial in his rehabilitation. “I was very lucky to hurt myself playing football and received a lot of support from the wider football community,” Vernon said. “I feel like that’s had a massive influence on my life, in a positive way, because it’s unbelievably tough, for not only the person injured but their family as well. Star Magpie Steele Sidebottom, former club captain Tony Shaw and Collingwood’s Victorian Wheelchair Football League skipper Brendan Stroud – all No.22s – are Team 22 ambassadors. 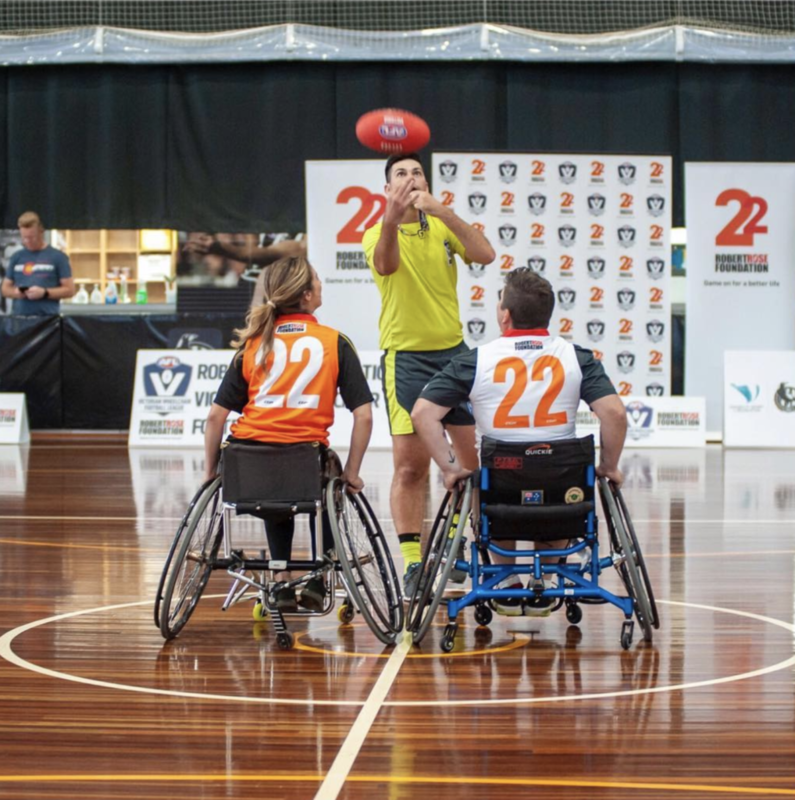 More Victorians will have access to playing Australian Football in 2019, with the return of the Robert Rose Foundation’s Victorian Wheelchair Football League (VWFL). A new frontier for wheelchair sport was created when Victoria launched the AFL Wheelchair League, in partnership with the Robert Rose Foundation in March last year. Team 22 focuses on helping spinal cord injury survivors enjoy a better life, by providing sporting and education opportunities, access to medical practitioners and counsellors and creating respite opportunities for family members. At SpinalCure Australia we fund research to cure spinal cord injury. SpinalCure Australia wishes to thank again the AFL for donating $50,000 to help fund vital research in November 2018. “Spinal cord injury is no longer a death sentence,” said SpinalCure Australia’s CEO Duncan Wallace. “We are developing new treatments to cure spinal cord injury. We need them as soon as possible”.